This morning Mia and I were searching for some alternative starch sources for an acquaintance with an allergy to potatoes, and I jumped to Wikipedia to verify that Sunchokes were Asteraceae (yes) and there have been some updates to the entry. One of them was espousing the virtues of Sunchokes as an ethanol crop. The entry claimed that one acre of Sunchokes can be converted to 1200 gallons of 99.5% Ethanol. That claim seemed ridiculous so I let it go and went on to other things. Right so I can’t just let this go, but you all knew that already. Ethanol from my favorite perennial food crop? So I went back to track it and it turns out the reference on Wikipedia came from one of my all time favorite sites: Journey to Forever, again confirming my growing suspicion that it does, in fact, contain the answers to literally everything.The JTF reference has about 30+ pages of text on ethanol production of which I read about 2, but it is basically just making strong beer-ok that is an over simplification but it ain’t hard. So if I can seriously make 1000 gallons of fuel on an acre (v. 200 for corn) the 20 acre farmstead just became alot cooler. That is enough fuel to drive about 23,000 miles if we could convert our Subaru to E-100 (28 mpg * 85% efficiency) or just buy an E-85 car and cut our own ethanol with regular gas. The process looks easier than making bio-deisel, but that is only at first blush. Regardless this sounds alot better than corn (6x the production/acre) while not having the no till advantages of switchgrass. I hope that it gets some real time in the debate at least.Surround the whole thing with another of the coolest things I have read about this week: the chicken moat or even a hog moat, to keep the acre of sunchokes from taking over the entire site. As much as I love pushing the limits of the HOA…I need land for all these ideas! So I had heard of Chicken Tractors, and like their utility and simplicity. I also really enjoyed the chicken coops in Mollison’s Intro to Permaculture where the coop is adjacent to several gardens that are each separated by a fence-and each section also has a door to the coop. The chickens can then be released to “till” in a section of garden, remove most insect pests, and fertilize the heck out of the garden. The Chicken Moat combines the two ideas to some extent while adding alot of utility to the traditional garden fence. The picture above is very ambitious. The runs would house dozens and dozens of chickens. A smaller version, say 30′ on a side, would effectively run the perimeter of my 7 beds. The gardens that Jacke demonstrates with are absolutely dripping with function stacking. On the outside the chicken fence is buried 18″ to stop burrowing varmints, and the planted thick with Comfrey and other mulch crops. These are planted fairly tight to the fence allowing them to be grazed, but not killed, by the chickens while also giving them some protection from sun and wind. The run is about 6′ tall and fenced the entire height with chicken wire, and then there is a larger opening arbor on top with serves as protection from hawks and climbing predators, but also holds grapes, hardy kiwis, and a variety of other edible vines. The model shown had openings on the garden side for the gardener to chuck weeds in through. If you put down a sawdust/chip mulch in the runs you would have all the compost you could ever need. Loves it. I can see something like this, but much stronger and with hogs, running the perimeter of the Sunchoke Acreage. Any errant tuber would be gladly eaten by the hogs rooting through the soil. Maybe I need hogs to stop my quack grass problems! Love it. 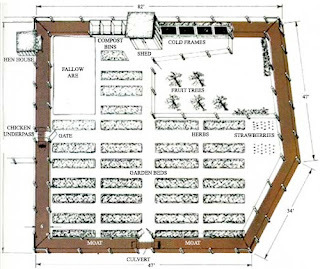 What are your thoughts on using the chicken/hog fence to also espalier fruit trees? I think the espalier would work just dandy with chickens, and depending on how much the hogs respect the fence I could see it there too. I’ve raised pigs and I wouldn’t recommend them living next to a harvestable fence. I love the chicken idea though. Dont worry keep quoting the book it has some unbelievable information. While its thick like some college course books its well worth the read. I do hope you bought both volumes 1 and 2?? ?